Today is the big day we’ve been anticipating for months – we officially will begin climbing the world’s tallest freestanding mountain! We woke up to the wonderful staff at the hotel bringing us yummy Tanzanian coffee with raw sugar (the good stuff, not the white processed stuff). This hotel is just top notch. Then, breakfast time (another big production) including all fresh foods, juices, and eggs made to order. After last minute prep and a nice shower (our last for five days), Desmond introduced us to our crew. We have 8 people helping us up the mountain – a cook, cook’s assistant, 3 porters to carry our stuff and all supplies we need (they carried everything on their heads! ), and 3 guides so that we each had our own guide. Our guides, Protas, Michael, and Isidori, are brothers and have each climbed Kili at least 50 times – Isidori has done it about 120 times. We feel like we are in good hands. 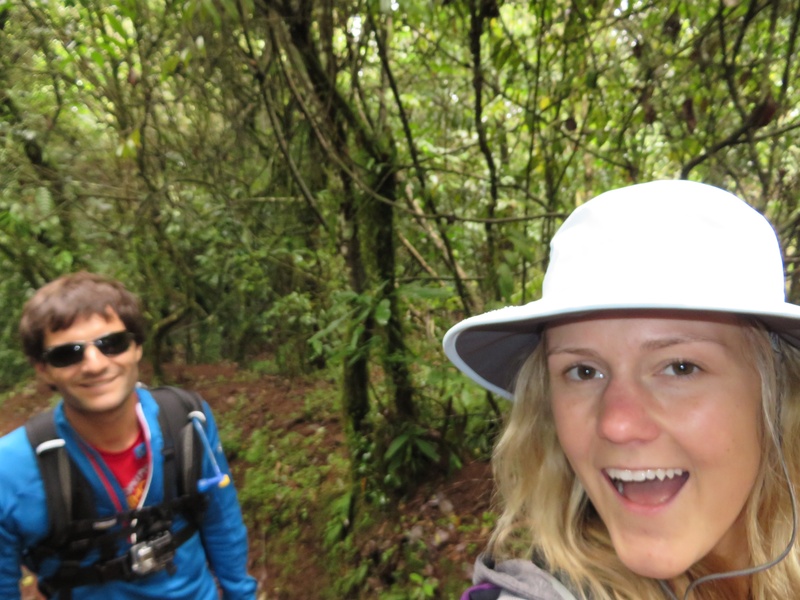 When packing – our fancy backpacks were not what we ended up sending up the mountain. Since the porters carry things on their heads, they preferred our duffles. Good lesson learned for others considering the climb. More blog posts on other lessons learned soon because we have some good experience now! 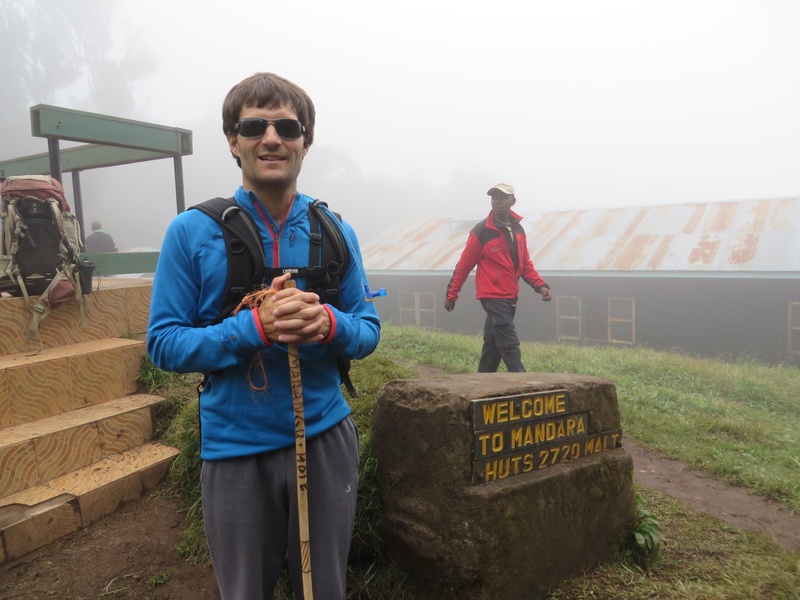 We drove to the entrance to the Marangu route on the mountain – we start off at about 6,200 feet above sea level today and climb to around 9,000 feet at the Mandara huts. The hotel gave us great, homemade walking sticks that are pretty helpful and much more rustic than the fancy ski poles we’ve seen people walking around with! We like ours much better. Our hike today was through the rainforest, so it’s muddy and damp. But the scenery is beautiful; everything is so green and lush. Walking pace was excruciatingly slow. We were warned about this (go “pole pole”, meaningly slowly slowly in Swahili) but this is like a snail’s pace! Our guides know what they are doing, but part of us just wants to run up to the huts. 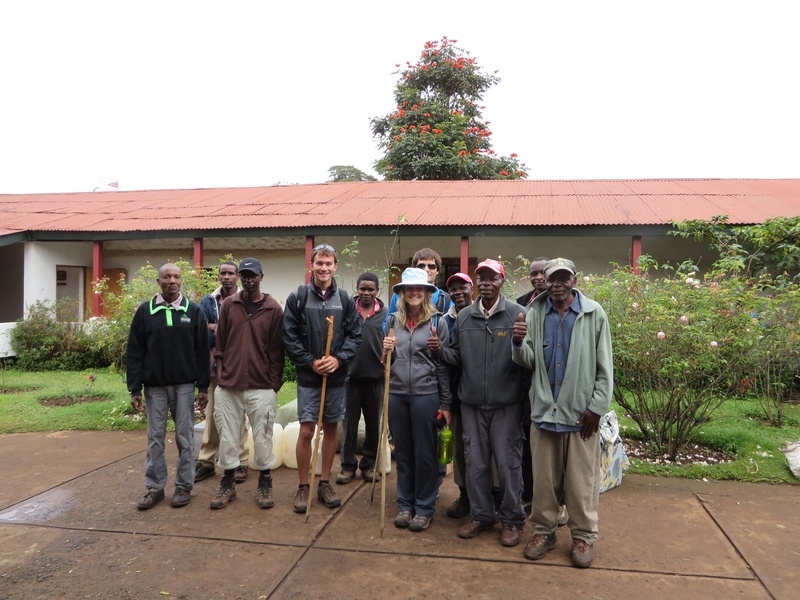 Once we made it to the huts, it was time for hot tea and biscuits, served by our wonderful crew along with hot water for us to wash our faces and hands, then a hike around crater near our hut. Its so cloudy here, and we are literally in the clouds right now, so the views were poor – apparently you can usually see Kenya from the crater. 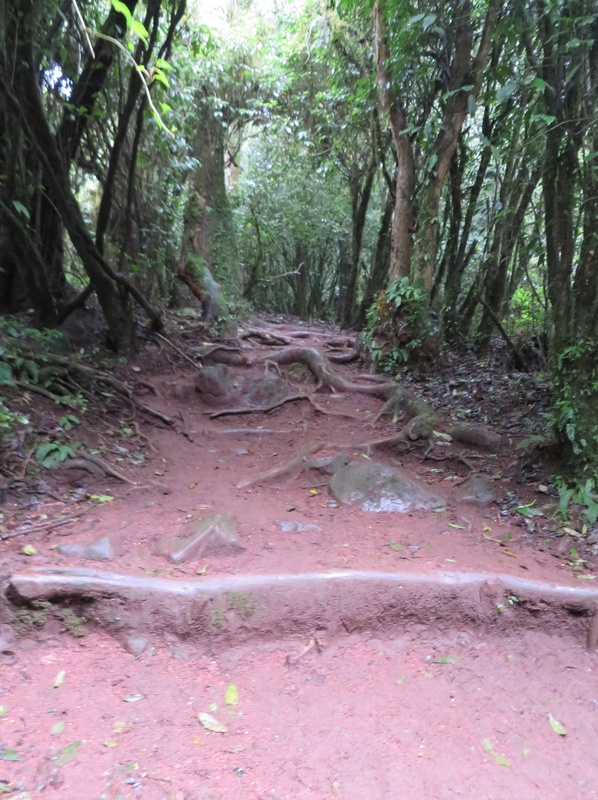 Not to mention we still haven’t even seen Kili, and we are climbing it! It’s above the clouds somewhere. You’ll see the cloud cover in the pix below. 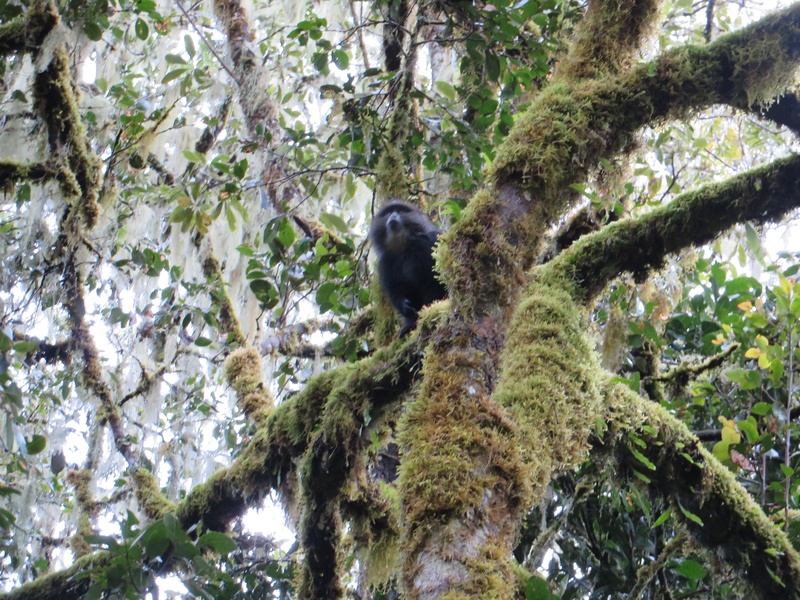 During our crater hike, we saw monkeys. Holy cow, we were not prepared for that. I though nothing was really alive on the mountain for some reason :). After the hike, dinner time. The food here is so amazingly good – always have tea or hot chocolate (for Nick), some sort of starter course, and the main dishes are really good. Lots of stews and curried veggies and rice. All the climbers eat together in a dining hall, so we got to meet a few various groups. No other Americans yet, lots of Swedes and British groups.